Home → Makeup Courses → Professional Makeup Courses → Why You Need A Professional Makeup Courses? 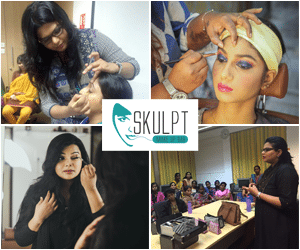 Why You Need A Professional Makeup Courses? For most people learning to apply makeup is a learning curve. We begin in our teen years, practice and experiment with not only different cosmetic products but even with styles. Some end up in disastrous results while some turn out to look actually well done. To apply makeup like a pro and stay up to date getting a professional makeup course is vital. From pictures, youngsters learn how to apply eyeliner or eye shadow. There are a few lucky ones that have an older sister, aunt or relative who gives them tips and tricks in those formative years. This is the basic way to learn where to apply blush or a highlighter. Others learn how to apply makeup by either going to a salon or a counter at a mall where they teach you a very basic level of applying makeup in the hopes that you will buy their cosmetics. For some, this is more than enough, but for most of us, the learning is not easy. We might try and try, but we are unable to apply the same makeup products with the same efficiency as a professional. It is not just learning how to apply lipstick and be good to go. A professional makeup course will teach you which products suit your skin, what cosmetics you should stay away from and a complete skin care. The lessons can be valuable for decades of your life. With course, you can achieve look that suits your lifestyle perfectly. For those who have taken a course earlier don’t turn away. Like technology, the cosmetic industry is ever growing they come up with better products that suit skin more. The trends and style also change with time. Therefore, to update your makeup fashion sense and to find better makeup that complements your present skin a course or a makeup class is important. For those who are too busy or can’t afford a professional course offline, online is a good option. Nowadays the internet has made learning easier. You can look up for the best makeup artist in the city/town or state you live in and check if they offer online makeup courses. Just keep in mind to pick the level that suits your competency. It is no use enrolling in a high-level professional makeup course if you can hardly hold a blush brush correctly. A professional course can also be used to become a career makeup artist, one of the popular and in demand profession of present times.